Assistant Professor Hisaaki Tanaka and his coworkers at the graduate school of engineering, Nagoya University, have discovered the mechanism for realizing high electronic conductivity in conducting polymers. Their paper was published online in Advanced Materials on December 11, 2013. A polymer is a large molecule formed by the repetition of several monomers. For example, plastic is a type of polymer. Conducting polymers are organic polymers that conduct electricity. They offer the advantages of high conductivity like metals and possess plastic properties, such as lightweightedness, flexibility, and environmental-friendliness. Owing to these exceptional properties, conducting polymers are considered to be potential candidates as organic electronics materials. Although previous studies have demonstrated conductivity in polymers, the structural mechanism underlying the high conductivity in polymers has not yet been unraveled. To this end, Prof. Tanaka's research group focused on the electronic structure of polymers to clearly elucidate the mechanism underlying the current flow. The group carried out the doping of PBTTT thin film, a polymer with a regular array and high crystallinity, with fluorinated alkyl silane (FTS) in order to induce electron transfer from PBTTT to FTS. As a result, positive electronic charges were generated on PBTTT and produced electronic current. In principle, the molecules in PBTTT thin film exhibit well-ordered edge-on molecular orientations. However, with FTS doping, a small part of the molecules changed its orientation to a flat-on orientation. Prof. Tanaka's group analyzed the precise position of the electric current flow in this state using electron spin resonance (ESR) technique, which measures the electronic concentration, motional condition, and molecular orientations at the microscopic level. Consequently, it is elucidated that molecules in the edge-on orientations have regular arrangement and allow electron flow, while those in the flat-on orientations have irregular arrangement and resist the flow of electrons. Therefore, they discovered that the high conductivity in polymers could be attributed to regular arrangement of molecules (high crystallinity). The research outcome revealed the relation between crystallinity and metallic conductivity and suggested that large crystals and thin films with more uniformity can exhibit increased conductivity. It is expected that the findings reported in the study will advance the performance of organic electronics materials toward the realization of high conductive polymers in solar batteries and organic EL. 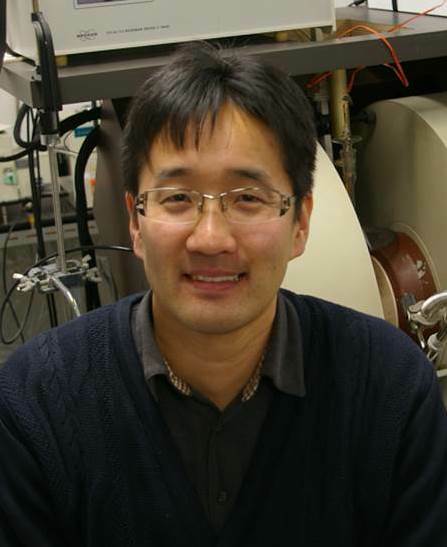 Prof. Tanaka chose organic electronics as his research target, motivated by his undergraduate education, understanding the various functionalities of organic substances. The fact that polymers can be conductive, generate solar electricity, and emit light, opened up exciting research opportunities. The structure of an organic compound is unimaginably diverse, even a small change in the structure producing a significant difference in its physical properties and device performance. The ESR technique used in this research can provide deeper insights on the electronic state of the charge carrier in materials at the microscopic level, contributing to a comprehensive understanding of various organic materials and devices. "Our research elucidates that metallic high electronic conductivity in polymers is prominently expressed in the crystalline region. Also, it suggests that bigger crystals and more uniform lamella can realize higher conductivity. Based on this guideline, I expect that organic electronic elements with higher performance can be materialized in the future." "When it comes to research, irrespective of the field, a starring outcome would have experienced numerous failures, trials, and errors. Although research is rather complex, I am filled with a sense of fulfillment when my research efforts advance by a sequence of small discoveries and improvements. It is a very special feeling to achieve significant results in research."